One of the first outsider settlements built on Tatooine, Anchorhead started as a desperate mining colony and has, over the centuries, grown into one of the largest spaceports on the planet. Anchorhead plays host to pirates and smugglers looking for a place to lie low, merchants and businessmen integral to the survival of the city's outlying moisture farms, and permanent residents who eke out a living running cantinas, fixing machines and otherwise maintaining the cultural infrastructure. The mining industry has faded away altogether in and around Anchorhead. It was Czerka Corporation that was most resolved to unearth valuable metals several centuries ago, and even after it became clear that no profit was forthcoming, Czerka maintained offices in Anchorhead on and off for centuries--committed not to write the planet off as a total loss. Stretches of sand pockmarked by canyons and rocky outcroppings, the Jundland Wastes mark the border between the great Dune Sea and the spaceports of Anchorhead and Mos Ila. 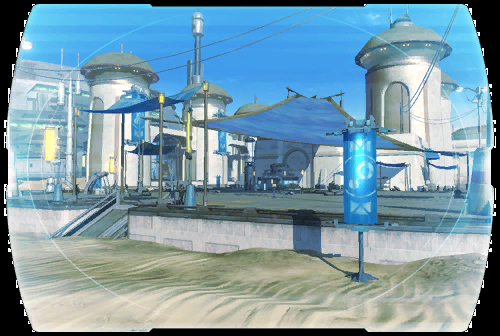 Home to a scattered few outposts and moisture farms along with Sand People, wild beasts and the kind of criminal scum unwelcome even in Tatooine's most disreputable settlements, the intense heat is far from the only danger. Jundland's cliffs are festooned with cave systems extending kilometers below ground, but mechanical problems related to the pervasive heat and sand mean they have never been properly mapped. Every once in a while, a brave individual builds a permanent shelter inside one of these caves. There's rarely anything left after a month, thanks to the predators of Jundland. Before the Empire converted the city into a garrison, Mos Ila was a settlement largely overrun by Exchange outlaws and smugglers. The local farmers and traders who made up the bulk of the population were at the mercy of the crime syndicate, which found Tatooine to be a perfect base of operations. When Imperial troops landed unannounced and swept all opposition out of the city, the residents reacted with mixed emotion--glad to see the Exchange gone, less certain of their new Imperial masters. Of all the wretched and lawless regions that dot the sun-bleached surface of Tatooine, there's one forsaken strip of desert that even the most hardened wanderers avoid: the Outlaw's Den. A ghost town whose sad history consists only of conquest, desperation and despair. Dozens of gangs, pirate crews and even native raiders have claimed the blighted region over the years, but never for long as the place seems to attract the criminal element like a lure. Some say the land is cursed, others say it's the ghosts of the murdered settlers who drive trespassers to violence, all that's really known is that no one is ever truly safe in the Outlaw's Den. A vast ocean of sand stretching endlessly into the horizon, the Dune Sea is the image that springs to mind when most think of Tatooine--even those who've settled on the planet. Few dare to wander too far into the wasteland, fearful of Sand People, hideous monsters and worst of all: the utterly unknown. Particularly brave Jawas have retrieved salvage during journeys into the Dune Sea, returning with puzzling devices and broken gadgets. No one is entirely sure how these scraps ended up in the wastes, but the occasional piece bears the worn, faded emblem of Czerka Corporation. In the middle of the Jundland Wastes, the land is split by a deep chasm known only as the Wound. The bottom is impossible to see from the upper ridge, and the rim of the Wound is dotted with the camps of Sand People. The Sand People seem to revere the Wound and are occasionally seen casting the dead into its depths. Most people consider the Wound a natural formation, but some fringe geologists believe otherwise. They speculate the Wound was created during a violent orbital bombardment in ancient times. Their evidence is thin, however, and many wonder why anyone would bombard such a remote and desolate world. A harsh desert planet off all the major trade routes, Tatooine is known for its heat, its sand, its dangerous wildlife--and little else. Only a few settlements dot Tatooine's endless wastes, inhabited by handfuls of traders and moisture farmers. Tatooine's obscurity has also attracted a small but significant criminal population, here to hide from galactic authorities. Tatooine lacks any central government or allegiance to Republic or Empire. There are rumors of an Imperial occupation taking place in one of the frontier settlements, but nothing has been confirmed.